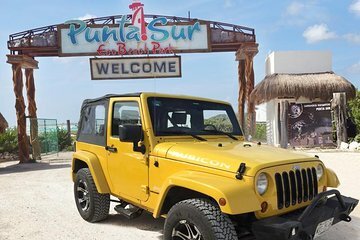 Osserva Cozumel da una Jeep dalla sommità morbida durante un tour alla scoperta del meglio dell'isola. Inizia a fare snorkeling in uno splendido sito della barriera corallina, poi imbocca la strada per il viaggio verso il faro di Cozumel, la Hacienda Tequila Museum e il bordo meridionale dell'isola: puoi fare una virata al volante o guidare la guida. Ti fermerai per un sostanzioso pranzo messicano vicino all'acqua, e goditi un po 'di tempo in spiaggia e facendo shopping prima che la giornata si concluda al traghetto Cozumel o al tuo hotel sull'isola. Jeeps are REALLY worn out. While the guide was good driving the jeep was taking my life in my own hands. It barely stopped and would only go in 2nd gear. Getting up to 45 felt like it was going to shake apart. Really more like a self guided tour since the guide was in another jeep. Essentially a i got you there do whatever tour. Please we ate lunch at was really nice and food was good. Totally loved this jeep adventure! Our guide Maria is awesome, friendly and attentive and explained everything so well to us. We did so much in 5 hours - snorkel, downtown tours, lunch, tequila tasting, eco park, beach tour, we barely made it back to our ship on time cause there's so much to do! Let me begin by saying our guides Freddy and Luis were awesome! They were friendly, funny and very patient. They were easy to find when we got off the boat and took us to snorkeling. While swimming about 25 yards off shore I lost my wedding ring in 7 foot deep water.. When they found out I had lost it they both went out looking for it. I figured it was just a nice gesture on their part but they actually found it in about 15 minutes! In addition to finding my ring they were very patient with my 10 year old son who is a beginning snorkeler taking him out with them and helping him. After snorkeling we then had an amazing lunch followed by a great tour of the island. My only criticism of this tour is that is seemed rushed and we barely made it back to our ship on time. The excursion took 5 1/2 hours. I don't know if I would do this particular tour again if I had it to do over again but I would definitely use these guides and their company Go Adventures but just for a different tour. I would give the tour itself a 4 star but because of Freddy and Luis I give it 5. This tour was awesome!! Our tour guide, Nataly, made our day so much fun! She took us to all the best locations and was very social and friendly!